How to be creative in small bathroom areas. With a guest bathroom it’s often the case that space is at a premium and it’s useful to know how to create extra room without making your bathroom look cluttered. 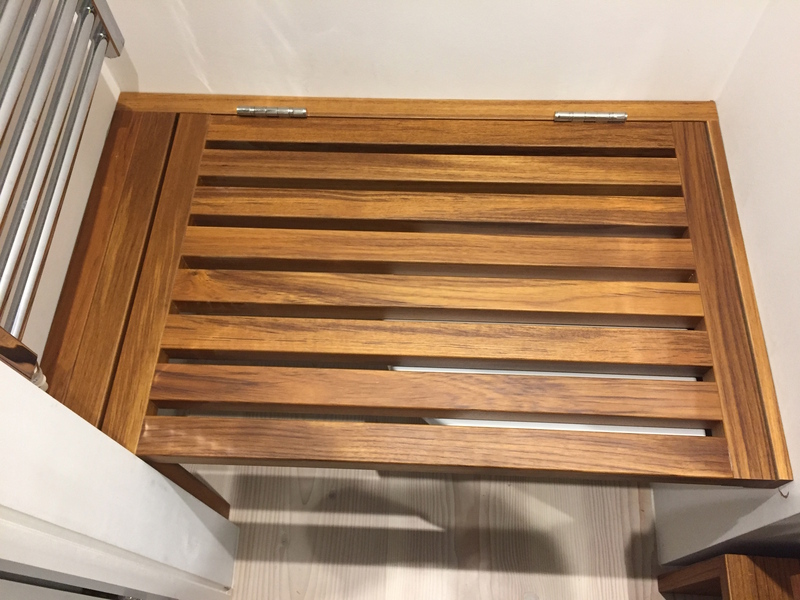 If you are putting in a teak shower grid, duck board or a teak bath and want somewhere to sit but the toilet is already taking up the space, a really useful way to create that extra seating area would be to put in a hinged teak duck board style seat that can be lifted when the toilet is needed, but when not needed can be lowered to hide it. The teak finish can then run seamlessly throughout the bathroom giving a wonderful warm feel with extra seating, similar to a recently completed project by the Urban Studio (London) Limited as shown.